UCF quarterback Blake Bortles beat out Louisville's Teddy Bridgewater for first-team All-AAC honors and is considered one of the top quarterback prospects eligible for the 2014 draft. SCOTTSDALE, Ariz. — Central Florida offensive coordinator Charlie Taaffe has a saying about quarterbacks who get to the point where they can reach their third progression on a play. "I say, ‘When you get back that far, you get the keys to the Maserati,’" Taaffe said. 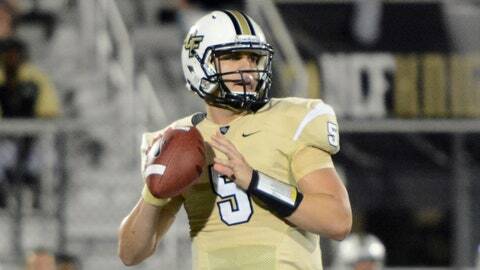 UCF quarterback Blake Bortles, Taaffe says, has gotten to that point. "I just don’t have the money to pay for it." Soon enough, Bortles might just have the money for it himself. Heading into the Fiesta Bowl against Baylor, Bortles remains undecided about whether to return to UCF for his senior season, but what’s certain is he’s done enough this year to position himself as one of the top few quarterbacks available should he decide to go pro. "He’s going to play at the next level," Taaffe said. "The question isn’t if, it’s when." It’s only been in the last month or so that Bortles’ stock has skyrocketed. CBS Sports moved Bortles up to No. 4 in its quarterback rankings, ahead of Heisman Trophy candidates A.J. McCarron and Jordan Lynch. ESPN ranked him No. 2 among quarterbacks, ahead of 2013 Heisman winner Johnny Manziel. The buzz really took hold when Sports Illustrated senior writer Peter King suggested on national TV that Bortles could be a top-10 pick if he chose to enter the draft. For his part, Bortles hasn’t let all the talk go to his head, and he swears he has "literally no idea" what he will do come decision time. "It’s kind of stuff you just let go in one ear and out the other," Bortles said Saturday. "It’s stuff that means nothing to me and means nothing to the success of this program and what we’re trying to do — win a BCS game." Bortles has, however, filed paperwork with the NFL Draft Advisory Committee to receive a draft grade. So despite his insisting he hasn’t thought about the decision, he at least acknowledges it’s a possibility he’ll go pro this year. The ascension from unknown to potential first-round pick has taken Bortles by surprise, which makes sense given his modest background. Out of Oviedo High School in Oviedo, Fla., Bortles didn’t get much attention. He had just five FBS offers, and only three of those — UCF, Colorado State and Western Kentucky — were to play quarterback. Tulane and Purdue wanted him as a tight end. "I didn’t know what to expect," Bortles said. "I was happy with one (offer), and anything after that was a blessing." Bortles decided to stay close to home and be part of coach George O’Leary’s building project at UCF, a school that’s only 50 years old. After redshirting one season and starting 10 games as a redshirt freshman, Bortles broke through as a sophomore, passing for 3,280 yards and 22 touchdowns and leading UCF to a bowl win. Still, Bortles received little attention nationally. He was, like most quarterbacks in the American Athletic Conference (previously the Big East), living in the shadow of touted Louisville signal caller Teddy Bridgewater, a presumed Heisman candidate and the quarterback most believe will be the first taken in the draft. "He deserved it all," Bortles says. "He’s a great quarterback, and I’m sure he’s going to play in the NFL and have a great career. But we just kind of worried about us and our team and trying to make UCF successful." Despite Bridgewater getting all the hype, it was Bortles who won AAC Offensive Player of the Year honors and nabbed the quarterback spot on the all-conference first team. Bortles also got the better of Louisville in what was UCF’s signature win. In a nationally televised Friday night game, the Knights trailed the then-No. 8 Cardinals 28-7 in the third quarter before Bortles led a 21-point rally in just over four minutes to tie the game. Louisville got back on top 35-31 with three minutes remaining, but Bortles led UCF on a 75-yard drive capped by his second touchdown to give the Knights a 38-35 win. It was UCF’s first win over a ranked opponent since 2009 and first ever against a top-10 opponent. It was also the moment Bortles and the Knights realized they had a real shot at a BCS berth. "After we beat Louisville, we kind of put ourselves in the driver’s seat." Bortles said. "It was, ‘All right, if we win out, we’re going to a BCS game.’"
It’s kind of stuff you just let go in one ear and out the other. It’s stuff that means nothing to me and means nothing to the success of this program and what we’re trying to do — win a BCS game. Bortles doesn’t come with the flash or larger-than-life persona of Manziel or the national championship success of McCarron, but he comes with intangibles that typically can’t be taught. "Like all the good quarterbacks in the country I respect, he can take a bad play and make a good play out of it, and he does a very good job of that," O’Leary said. "He works with the game. He’s never too high, never too low, and he keeps his poise." Like he does with draft talk, Bortles lets praise of his play-extending ability roll off his back. "That’s just kind of running away from people, not wanting to get tackled," Bortles joked. "That’s all that is. … I know if I can extend it long enough, I’ll be able to find somebody." Bortles also has the invaluable ability to protect the ball. He’s thrown just seven interceptions this season, as he did last season. Two came in UCF’s only loss, to South Carolina, and two in a close 23-20 win over South Florida. And as Taaffe noted in his Maserati story, Bortles has become a smarter quarterback, able to read defenses and adjust accordingly. That will serve him well should he decides he’s ready to go pro. UCF also hopes it will serve the Knights well as they try to upset No. 6 Baylor on Jan. 1. It will be Bortles’ biggest test since playing South Carolina. He threw for 358 yards and two touchdowns in that game, a three-point loss. He should be able to get the UCF offense going against Baylor, but it may come down to UCF’s defense limiting the nation’s No. 1 offense. The game could very well be Bortles’ last in college. He says he’s only looking at it as the last game of the season, but he’ll have to face reality once the game ends. As the line of questioning on his decision persisted Saturday, Bortles remained steadfast that he hasn’t even thought about the NFL yet. But once the TV cameras disappeared and Bortles was prodded just enough, he finally gave an inch. "You can’t not think about it when your lifelong dream is right there," Bortles said. "Itâs definitely in the back of your mind." O’Leary has already met with Bortles and his parents to discuss the decision, but neither he nor Taaffe know what Bortles will do. If they do, they’re not admitting it. Taaffe couldn’t help but crack a joke when asked if he thought Bortles would be better off making the jump now or staying at UCF. "Selfishly?" Taaffe deadpanned before offering an answer. "I don’t think the growth process ever stops, so whether it’s here for another year, or I think in a perfect world, if he did decide to go to the next level, it would be somewhere where he could go and not get thrown into it right away." There may be more high-profile announcements in the coming weeks from players deciding whether to enter the draft — think UCLA quarterback Brett Hundley or Texas A&M receiver Mike Evans — but Bortles’ could be one that shakes up draft boards across the NFL.